NEW DELHI: Poorly-lit stretches in the Capital or those with defunct streetlights serve as a haven to anti-social elements who easily escape after committing such crimes. And Sunday’s gangrape of a 23-year-old girl has once again highlighted this very horrific fact. The Delhi police had identified 1,300-odd stretches that were either poorly lit or had nonfunctional streetlights in May this year. In 2011, there were only 650 such roads. The Delhi police said crimes against women mostly take place in such areas. The police are planning to send a list of such stretches to civic agencies once again, urging them to repair the streetlights. "We have decided to send a reminder to all agencies as they have failed to rectify the problems that we had highlighted earlier," said a police official. 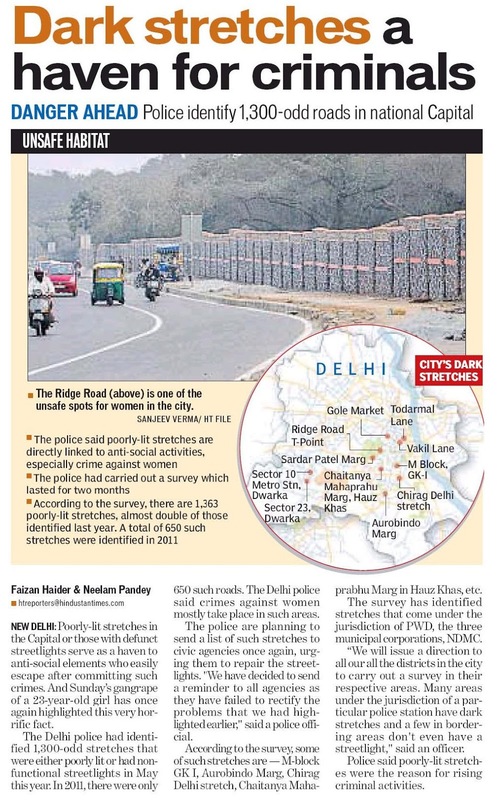 According to the survey, some of such stretches are — M-block GK I, Aurobindo Marg, Chirag Delhi stretch, Chaitanya Mahaprabhu Marg in Hauz Khas, etc. The survey has identified stretches that come under the jurisdiction of PWD, the three municipal corporations, NDMC. “We will issue a direction to all our all the districts in the city to carry out a survey in their respective areas. Many areas under the jurisdiction of a particular police station have dark stretches and a few in bordering areas don't even have a streetlight," said an officer. Police said poorly-lit stretches were the reason for rising criminal activities.